Analytical chemistry rewards creative thinkers who see opportunities, not barriers, between disciplines, according to Professor Michael Breadmore. Michael and his team at the University of Tasmania are developing 'lab-on-a-chip' portable analytical devices that allow users to put a sample in and get an answer out on the spot. These devices have the potential to revolutionise clinical, forensic, environmental and industrial applications. Professor Michael Breadmore is an analytical chemist and ARC Future Fellow at the University of Tasmania's College of Sciences and Engineering. Quick to dispel any ideas that analytical chemists have a limited research field, Professor Breadmore points out, 'I use ideas and technology from all kinds of areas. You can see this best in what's been nicknamed 'lab-on-a-chip' technology, which involves separating complex mixtures of chemicals on a miniature scale. 'Over the past five years I have focused on three main application areas: the first for the detection of trace levels of pharmaceutical pollutants within natural and waste waters; the second on the detection of pharmaceuticals in biological fluids, such as blood, serum and urine; and the third on the ability to rapidly detect homemade explosives. Professor Breadmore and his team have developed two systems that detect homemade explosives: Scantex and CEScan. CEScan is the first comprehensive lab-based instrumentation in the world to detect the full range of explosives, including military, commercial and homemade inorganic and peroxide explosives, overcoming the limitation of existing screening techniques that struggle to detect modern explosives. Scantex isn't comprehensive but does one thing very fast – screen for inorganic home made explosives. 'Now we can detect trace levels of all inorganic explosives in under a minute. There is no other instrumentation currently available that can match our speed, sensitivity and price. Fast-fact: Professor Breadmore, along with colleague Professor Emily Hilder, are two of only three Australian academics to be recognised in Analytical Scientist magazine's inaugural Top 40 Under 40 Power List. The international compilation honours the next generation of up and coming scientists: those who are pioneering new research innovations across the sciences. Professor Michael Breadmore's expertise lies in the application, understanding and exploitation of the hydrodynamic and electrokinetic phenomena in capillaries and microfluidic devices for the analysis of complex samples. He is particularly interested in the development and integration of sample treatment to construct sample-in/answer-out portable analytical devices. These devices have clinical applications for diagnostics and therapeutic drug detection, forensics for profiling and the detection of illicit drugs and explosives, environmentally for management of nutrients and pollutants, and industrially to control process streams. Professor Breadmore commenced an ARC APD fellowship in May 2004, an ARC QEII fellowship in Jan 2009, and an ARC Future Fellowship in 2014. Professor Breadmore received his PhD in 2001 from the University of Tasmania before undertaking his first postdoctoral position at the University of Virginia, USA to work on portable analytical technology for genetic diagnostics. He then moved to the Institute of Clinical Pharmacology at the University of Bern, Switzerland, where he developed electrophoretic methods for therapeutic drug monitoring of anti-fungal and retroviral drugs, with the methods implemented routinely in the adjacent hospital service lab. He then spent eight months working with deltaDOT, a small biotechnology instrumentation company, and helped design their commercial capillary electrophoresis instrument. In 2004, Professor Breadmore returned to Australia as an ARC postdoctoral fellow, in 2009 was awarded an ARC QEII Fellowship and in 2014 began an ARC Future Fellowship. Professor Breadmore has taught at the interface of chemistry and engineering for over 10 years, and in pure and applied analytical chemistry with a focus on electrophoresis and microfluidics. He has a keen interest in inter-disciplinary teaching, particularly assessment and how this is influenced by discipline conventions, as well as exploiting these conventions in unconventional disciplines. Professor breadmore's research interests lie in the application, understanding and exploitation of the capillary and microchip electroseparation techniques for the analysis of complex samples with real world significance. He is particularly interested in ways to perform construct sample in - answer out portable analytical devices for clinical, forensic, environmental and industrial applications. Professor Breadmore's research spans many discipline boundaries and ranges from fundamental theoretical studies using computational fluid dynamics and the construction of new analytical microfluidic hardware, through development and optimisation of chemistry, finishing with the routine analysis of samples. Capillary Electrophoresis; Microfluidics; Lab-on-a-chip; 3D printing; Portable Instrumentation; Nanofabrication; Drug Monitoring; Clinical Diagnostics; Environmental Pollutants. Professor Breadmore's research focuses on the development of sensitive analytical methods based on electrophoresis and chromatography. In particular, methods that can analyse untreated samples that can be implemented in a portable lab-on-a-chip device and the construction of these devices. He has focused on three main application areas: ample-in/answer-out strategies for clinical diagnostics and therapeutic drug monitoring, detection of trace levels of pollutants within natural and waste waters, and the rapid and portable detection of improvised explosives. Over the past several decades there has been increasing awareness of our natural environment and the impact upon it that humans have had. This includes commonly accepted fertiliser run-off from agricultural land and unregulated compounds such as pharmaceutical drugs and other consumer products – which are now commonly found in waste water effluent at µg/L levels, and in rivers and lakes at the low ng/L level. Professor Breadmore has developed simple analytical methods that will be implemented in portable hardware for on-site monitoring of these pollutants. The development of portable sample-in/answer-out devices has the potential to significantly impact our analytical capabilities, offering substantial improvements in terms of speed, cost of analysis, portability, simplicity of operation, and safety. It is well known that earlier detection and treatment of cancer improves patient outcome and recovery, and there is increased evidence that early diagnosis of neurological disorders, such as Alzheimers, Parkinsons, etc., can initiate treatment that will significantly slow their progression. The same technology also has application in therapeutic drug monitoring, in which an individual's treatment regime is monitored and adjusted based on the actual levels within a patient, and is a critical component of treating many chronic diseases such as, HIV/AIDS, and mental conditions such as schizophrenia and depression. Professor Breadmore has developed and implemented new technology and methods for genetic diagnostics, and for pharmaceutical and illicit drug detection. Homemade explosives represent a significant threat to national security because they can be made from ingredients that can be purchased from hardware and grocery stores as well as through more specialist shops for hydroponics, fireworks and swimming pools. These types of explosives have been used in most of the major terrorist attacks over last two decades, such as those in Oklahoma, USA (1995), Bali, Indonesia (2002-2009), Prune, India (2010), and Oslo, Norway (2011). Professor Breadmore has led research in the field of portable instrumentation and methods for post-blast explosive detection and, more recently, is developing the first analytical instrument for screening of inorganic homemade explosives. The ability to implement the above sample-in/answer-out strategies relies on the ability to develop microchips and associated portable hardware. 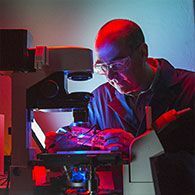 Professor Breadmore has made a number of innovations in hardware and instrumentation, as well as in microfluidic fabrication, through the use of consumer hobby equipment such as office laminators, laser engravers and 3D printers. Professor Breadmore has numerous collaborators within Australia and around the world, and is working with national and international companies on industrial research and translation of academic research into commercial outcomes. Professor Breadmore has projects on (1) technology for point-of-collection testing for clinical, forensic, industrial and environmental applications; (2) additive manufacturing of microfluidic devices; (3) new technology for understanding the impact of traumatic brain injury. Professor Breadmore publishes in the highest quality analytical chemistry and general chemistry journals. He is on the editorial board of Electrophoresis, Journal of Chromatography A, Journal of Visualised Experiments and Aviation Security International and is an editor of the Australian Journal of Chemistry. Professor Breadmore has been awarded funding from the Australian Research Council (ARC) through Fellowship, Discovery and Linkage schemes, as well as funding on instrumentation for explosive detection through the National Science Security and Technology Unit (Aus). The proposed Joint Research Centre (to be funded via the Federal Government Australia-China Fund) is designed to improve fundamental capability in the area of mineral processing between Australia and China with a goal of developing the next generation of in-line chemical and mineral sensors for process optimisation. It is a partnership between the University of South Australia (UniSA), Central South University (CSU), the University of Tasmania (UTAS) and Magotteaux one of the premier suppliers of grinding media to the mining industry. It will build upon the core strengths of minerals processing at UniSA and CSU, and the analytical and microfluidic capabilities of UTAS to produce technology implementable by Megatteaux. A Phd Stipend and operating funds for research on cation electrophoresis. The ability to effect near real-time analysis of Perfluorinated environmental contaminants will result in an effective tool for swift contaminated site assessment, drinking water monitoring and waste water treatment efficacy. No current unit is viable for the field testing of such compounds. These compounds are considered persistent organic pollutants and are restricted under the Stockholm convention. This project would provide a solution to a globally expanding problem. GreySCAN is a new instrument for detecting explosives at airports. This was developed from funding through an ARC Linkage Grant and the National Science and Security Technology Unit. The technology was licensed to Grey Innovation in 2014 and they are now translating the outcomes. This proposal will provide an opportunity to discuss the development of a truly revolutionary manufacturing method for microfluidic devices via multi-material 3D printing. Funds will be used to engage with one of the world's leading manufacturer of 3D printers formicrofluidics. New low-cost sensors to quantify a range of water nutrients for continuous automated water monitoring willbe developed. A microfluidic cartridge will be designed to obtain a particulate-free sample, which will beanalysed by the rapid separation of inorganic anions and cations. This will be operated in a portable low cost,low weight, low power instrument. Deployment of multiple units will provide a continuous data streamdescribing the changes in nutrient profiles within various waters and that will feed into environmental modelsand inform best practice for agriculture and aquaculture industries. This PhD project seeks to develop a tool for real-time flavour profiling of oak wood to objectively classify wine maturation products according to their chemical composition and wine flavour impact. Natural variation in the chemical composition of oak wood is the key challenge in producing maturation products with predictable properties. Current evaluation methods require time-consuming and labour intensive sampling procedures for expert lab-based analysis. The lack of oak chemistry data results in identical seasoning and toasting protocols even though oak chemistry is known to vary greatly, among species, sites, and between and within trees on the same site. The wine industry is forced to rely on subjective descriptions of product quality that are inherently difficult to relate to wine quality impact. The increased use of barrel alternatives further accentuates the need for improved quality control in oak wood production. Prior research has shown that the different piece sizes and toasting methods applied to barrel alternatives is unlikely to create flavour profiles that match traditional barrel toasting methods. The chemical composition of barrel alternatives varies greatly and has not been clearly related to current product specifications (either oak species or to wood toasting). This research will exploit frontier analytical technologies currently being developed for novel medical, security and food industry applications. The approaches under investigation include ambient mass spectrometry (AMS) and Differential Mobility Analysers (DMA). These technologies hold great promise for bringing powerful (sensitive) chemical analysis from the lab to reality through real-time, at-sample chemical analysis using miniature, portable, cost optimized analytical devices. These sensors are highly selective and thus poised to overcome the key limitation in alternative approaches such as Near Infra-Red Spectroscopy. The project will develop three unique chemical approaches that will each overcome a challenge to the creation of advanced miniaturised analytical devices with sample-in/answer-out capability. This will provide substantial improvements in speed, cost, portability, and operational simplicity and safety. New technology for analysing drugs in body fluids will be critical in enabling people to closely match their pharmaceutical consumption with their individual requirements. The advance will have implications for all patients, particularly those in Australian remote and rural populations. The same technology is likely to find applications in environmental monitoring of emerging pharmaceutical pollutants. The objectives of the project are: 1) to work with leading researchers with expertise in the application of real-time mass spectrometry and chemometrics; 2) to gain practical experience of proton-transfer-reaction mass spectrometry 3) to conduct preliminary assessment of the potential of this technology for real-time analysis of oak wood volatiles; 4) to meet with R&D personnel of an innovative manufacturer of mass spectrometry instruments to discuss instrument developments, alternative analytical approaches and potential collaborations; 5) to learn about state-of-the-art applications of mass spectrometry in food chemistry. This project aims to develop screening technology for inorganic and peroxide homemade explosives. It consists of a front end sample interface, a rapid capillary electrophoresis separation of inorganic anions and chemiluminescence detection of peroxide explosives after degradation to hydrogen peroxide. The proposed research will consider two approaches for peroxide separation: a short liquid chromatography column; and a second approach focusing on rapid degradation of H2O2 or utilisation of degradation kinetics to differentiate different peroxides. The new fast imaging Raman system will be used to satisfy the research needs of a wide range of research projects within the chemical, health, pharmaceutical, material and earth sciences at UTAS. The facility is expected to substantially enhance the research outcomes of several internationally renowned researchers at UTAS. Microfluidics is a highly promising platform for the analysis of drugs and metabolites in biological samples, such as blood, serum and urine as these samples can be analysed directly on-site in a highly integrated device called a micro Total Analysis System (pTAS). This contains a complex fluidic circuit which seamlessly integrates multiple processes to allow the complete analysis of a sample. In this application, a uTAS will be developed for the analysis of drugs and metabolites in biological fluids by incorporation of a matrix elimination step, on-line enrichment, reaction with a fluorescent reagent and separation by electrophoresis. This will allow the rapid on-site determination of drugs for therapeutic drug monitoring and forensics. Professor Breadmore has graduated 12 PhD students and is currently supervising nine. All students work as part of a dynamic team with a focus on fundamental and applied analytical chemistry that is of relevance to an issue of international significance. There are always vacancies in the group for highly talented and motivated students keen to explore the interface of chemistry, engineering and medicine.